Dear readers, Miss Bates has been scarce lately: 😦 , the world is too much with her. For the next few weeks, likely months, she offers mini-reviews, much as she’d prefer to wax loquacious. Better a mini-review than none at all, though! 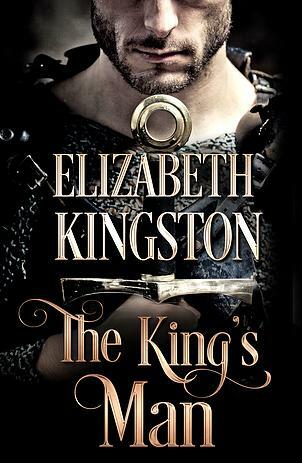 Her first such is a historical romance novel, set in late 13th century England and Wales, Elizabeth Kingston’s The King’s Man. It opens as Gwenllian of Ruardean cares for the injured Ranulf Ombrier, Of Morency. He lies feverish, envisioning Gwenllian as ministering angel. Beyond his injuries, Ranulf, frighteningly handsome to the plain, tall, gawky Gwenllian, suffers spiritual torment, pleading with Gwenllian, a hold on her wrist and tormented eyes, to push her dagger into him. What torments him? What has brought this notorious Norman lord, king’s man to Edward I, the king’s assassin, to her family’s castle? Gwenllian, a woman trained in combat, in command of men, is as much her mother’s “woman” as Ranulf is the king’s: stripped of her womanliness by a mother who wants her to be a weapon in preserving Welsh independence against Edward’s hegemony. Lady Eluned, Gwenllian’s mother, bids Gwenllian return Ranulf to King Edward; thus begins a journey bringing Gwenllian and Ranulf, and the push-pull of their antagonism and peculiar attraction, her beast to his beauty, to Edward’s court, landing in the machinating, self-seeking king’s hands. Gwenllian, once promised to Aymer of Morency who was killed by Ranulf, was to be lady of Morency. To this day, her family contests Morency lands. Edward seizes an opportunity of Ranulf and Gwenllian’s presence: he announces their impending marriage, rids himself of a thorny conflict between two powerful families, and seals Ranulf and Gwenllian’s strange symbiosis and rancour and attraction. There are strengths to Kingston’s novel. Capturing the strangeness of the Middle Ages is challenging to the romance writer, but Kingston skillfully builds a mood of life lived closer to death than anything we’re familiar with. Her characterization too manages to be both familiar in her characters’ humanity and steeped in historical affect. Miss Bates especially appreciated Ranulf’s religious agony: his sense of sin and guilt, repentance and fear of the after-life. While his killing Aymer, as Gwenllian and reader come to recognize, was an act to avenge the innocent, Ranulf’s horror at his deeds feels real, in keeping with a medieval religious ethos. There is a pitilessness to Ranulf and Gwenllian’s world and lack of sentimentality to Kingston’s romance. In Ranulf and Gwenllian, there is desire and need, but love and care take a long time coming. There is in hero and heroine a disconnect to their feelings, an alienation from them that rings true given who they are and times in which they live. Ranulf and Gwenllian are torn by divided loyalties, his to his king, but more so to his new-found repentance, and Gwenllian to her mother and clan. When those loyalties are tested, Ranulf and Gwenllian betray the other. How they cross over breaches of trust pulls powerfully at the reader’s heartstrings. Values of trust, honour, and loyalty tell us about Ranulf and Gwenllian as a couple within a particular society, a time and place. Equally interesting are Ranulf and Gwenllian’s personal vulnerabilities. These come in the form of crises of their sense of masculinity and femininity, respectively. In Gwenllian is a woman who’s never learned to be a lady, never taught the womanly arts, never been given in promise to a man; she mourns not being soft, not having a lover, children, a household, even while she loves her men, her strength, her mission. Ranulf’s desire and need, their marriage-bed and her place as lady of Morency change her. She recovers a sense of herself as a woman she thought eradicated by her mother. She doesn’t relinquish her fighting self, but integrates it into her new sense of self for something whole and new. Ranulf grew up much beloved by his adopted father, Aymer. But Aymer’s dark side, his abuse of wives and servants, drove Ranulf to kill Aymer. When Gwenllian finds him, he suffers from guilt; when they marry, Ranulf’s guilt deepens, is revealed as the fear he will be like Aymer. He knows how Aymer erred, but doesn’t know how to be a man who doesn’t live by sword and fist. Transferring loyalties to the other, in loving the other, Ranulf and Gwenllian gain a new sense of self, forge a new kind of family, free of their parents. Kingston’s treatment of this theme of identity, loyalty, and love is wonderful. But not all is well with Kingston’s romance. Miss Bates admits it took her a long time to be engrossed in the narrative. Slow pacing marred it up until Ranulf and Gwenllian’s marriage to the king’s convenience. Maybe Miss Bates is too used to the get-into-it-ness of the category romance, but she’d have loved this romance to’ve started at the mid-way point. (Kingston couldn’t concede a word of her narrative to the chopping-block.) Moreover, Kingston’s dialogue suffers from medieval-itis: it’s difficult to give readers a sense of the cadence and strangeness of an era’s speech and not sound contrived. While Miss Bates, in the above paragraph, lauded Kingston’s romance for its lack of sentimentality, she raps its knuckles over a lack of sentimentality and melodrama, the foundations of great romance. There’s a coolness, a distancing from the narrative, that disappointed Miss Bates, though she’ll concede Ranulf and Gwenllian’s final reconciliation was magnificent. Miss Bates wishes the romance, in its entirety, were more succinct and intense. With Miss Austen, Miss Bates says of Elizabeth Kingston’s The King’s Man offers “real comfort,” Northanger Abbey. Elizabeth Kingston’s The King’s Man is self-published; it has been available since June 20th and may be had at your preferred vendors. Miss Bates received an e-ARC from the author. A mini-review from Miss Bates? Rather than none at all? I was intriqued enough to look for it on Amazon, where I found out that “The King’s Man” is a very popular title. Now I’ve got 2 more books on my WL, this one and another with the same name by Alison Stuart which sounds really good! I think you’ll really like it, it demands some patience in the first half, but really delivers in the second. It IS a popular title, I noticed that too.